The committee boat (big tin) and safety boat (rib) are to be found at Royal Quays Marina. You will need to check at the marina office what berths the boats are in and what the pass-word is for the security gates. Please note that we normally have the following berths at Royal Quays: 26 – Old RIB, 27 – Committee Boat, 28 – New RIB. 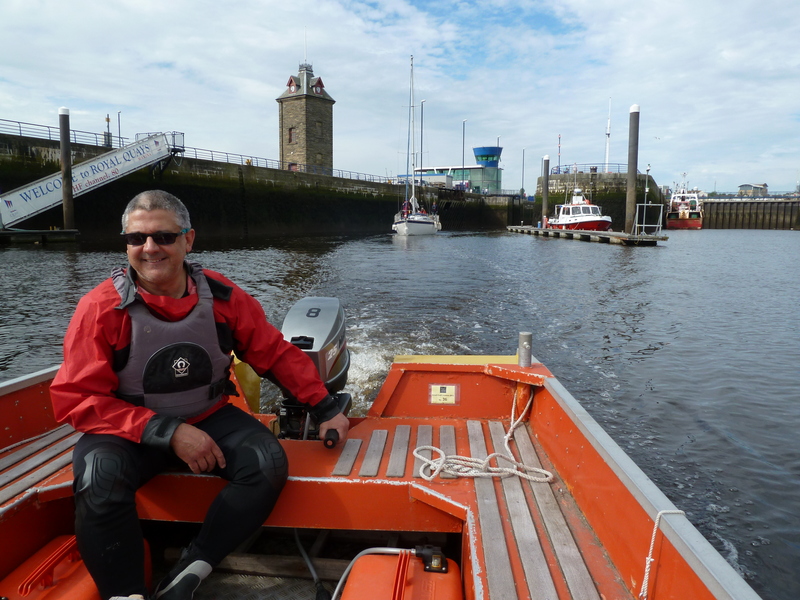 The new RIB (Doreen) should be used for normal rescue duty. Please try to ensure the boats go back to the correct berths. There is a changing room (and toilets) at the marina and the office staff will advise you of the security password to access these. Collect vhf radios from Marina Reception prior to going afloat. Race officers should also collect the portable airhorn and a TSC hand-bearing compass both of which will be stored (with the vhf’s) behind reception. Unless something has happened all of the kit you need to act as committee boat, safety boat, will be left in the boat ‘from the last time’. If for some reason (it is not very likely) it has had to be moved from the boat it will have been stored for security in the clock tower. If this is the case staff at the marina office will provide you with a key for the lock. Unless the same security or safety reasons exist you can leave the kit in the boat. Refuelling of the boat fuel tanks takes place at the fuel berth at Royal Quays. There are 2 tanks in the committee boat & ribs so if one is almost empty (!) radio the marina and ask them to fill you up. You just need to sign the book once thats done by the marina staff at the fuelling pontoon just outside the locks. Unless it is likely to be exceptionally hot over the next few days the breather cap is best closed at the end of the duty. Remember at the start of a duty to check it is open before you set off ……or the engine will stall! Also remember unless you wish the boat to sink during the week and or the next person in the boat to spend a long time bailing it out CLOSE THE BAILERS AS YOU LEAVE THE BOAT. As you leave and return to the marina please show consideration for other users and GO SLOWLY and CAREFULLY. Follow the instruction if given from the staff at the marina office as to where to place the boat in the lock. When leaving the lock to come up to TSC move across the river smartly to the starboard ‘right hand side’ of the river (look right as there may be a large ferry coming your way) and then travel up to TSC being careful not to create a large amount of wash for the moored boats. The same applies on your return; come back on the starboard side of the river. Everybody has been nervous about coming in/out of the marina and especially so if the lock is full of big boats and crew are looking at you wondering if in your heavy tin boat you will put a large hole in their hull. Don’t panic and take your time and ask for help, as it will be given. Aware as we are that the boats are anxious to get back to Royal Quays at the end of what may have been a wet, windy and cold duty please do not leave the race area until all of the boats are safely to shore and accounted for. It is an essential aspect of the safety cover on offer at TSC that the safety boat is not ‘released’ from its responsibilities by the Race Officer to return to Royal Quays until s/he has confirmed the safety of all crews i.e. they are on the beach and trolley has its boat upon it. When packing up, please place the grey tarpaulin over the marks in the committee boat to prevent the hi-viz fluorescent orange mark covers fading in the sunlight. Always secure both mooring lines (and the towing warps) immediately on leaving the lock at Royal Quays. If the engine stops the first action is normally always to drop the anchor. If washed into shallow water (rocks or sand) lift the engine. Avoid coming into The Haven unless required for an actual rescue. When conditions are such that sailing may be cancelled safety boat crews should pre-plan contact with the club (or SSSC) to confirm if they are required or not. When large seas are running keep a long way upwind / upsea of the lee shore. Racing outside of the harbour walls will take place in either the north or south bay at all times well away from the commercial traffic channel. At least one safety boat and crew will accompany all dinghy sailing and when racing, a committee boat will be in attendance. All safety and committee boats will be in radio communication on channel 37. The call sign for the committee boat is TANGO 1. A plea from the Sailing Sec: please make sure the result sheets are legible and include helm names as well as sail numbers.